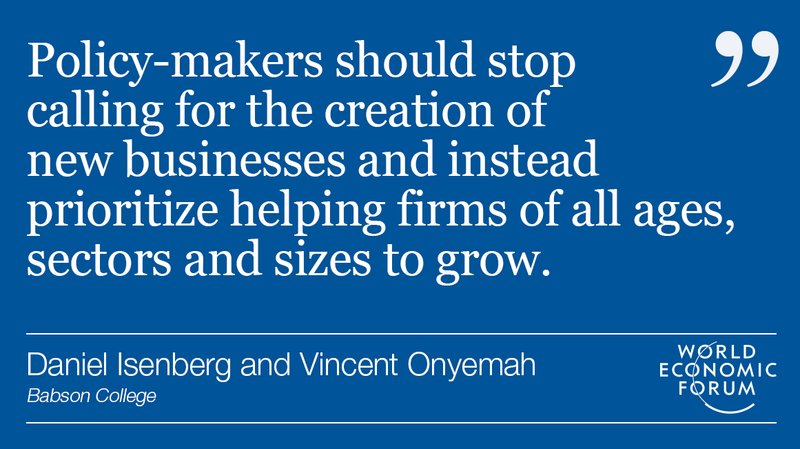 For entrepreneurial activity to translate into economic growth, we need to focus less on the “start” and “small” side of things and more on how those companies of all ages, sizes and sectors scale. Why? Because research (see here , here and here ) clearly shows that it is relatively high-growth firms – what we call “scale ups” – that are the real generators of jobs, taxes and wealth. Contrary to the myth, small businesses and start-ups only generate these benefits if they then go on to grow. And historical perspectives on the growth of entrepreneurship from Israel to Bangalore to Silicon Valley shows that the critical path to prosperity paradoxically goes from scale up to start-up, not the other way around. With the hands-on professional guidance of the Babson Entrepreneurship Ecosystem Project , 71 companies in five cohorts have grown by about 35% each (as of March 2016), so far directly creating 1,291 new jobs and 1,451 new contracts; 12 of the ventures became exporters for the first time. Because Manizales-Mas – the name given to this entrepreneurial project – first focused on existing firms with growth potential, it only took a year to see the first growth impacts, for example, in new exports. In four years, the number of jobs directly created by Manizales-Mas, leaving aside unmeasurable spillovers, is greater than the increase by the city’s biggest employer. Rather than being restricted to an elite, the changes in Manizales are beginning to seep into local culture, as several independent surveys demonstrate. When asked whether they were proud of their city , 82% of respondents in Manizales said yes in 2012; by 2016, that figure had increased to 91%. Over that same period, Medellín, for example, saw a decline from 80% to 79%. Bogota saw a smaller increase in pride from 46% to 50%. Looking at another measure, Michael Porter’s Social Progress Index of cities in Colombia ranked Manizales number 1 among the 16 largest Colombian cities, and the “ease of creating a company” in the city increased by 140 %. When we spoke to investors from Medellín, they told us that Manizales’s obsessive focus on growth and systematic support for scaling up reduces their risk of investing in Manizales companies by at least 2%.